World No. 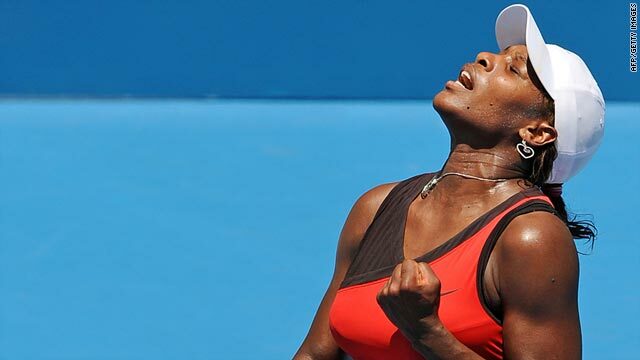 1 Serena Williams celebrates winning a game during her victory over Maria Jose Martinez Sanchez. (CNN) -- Serena Williams and Dinara Safina, the world's top-ranked women's tennis players, made winning starts to their 2010 season at the Sydney Invitational tournament on Tuesday. No. 1 Williams easily dispatched Maria Jose Martinez Sanchez, beating the Spaniard 6-1 6-2 in the second round after being given a bye. The American, who was expected to face Justine Henin before the former world No. 1 pulled out of the tournament due to a leg injury, will play qualifier Vera Dushevina in the quarterfinals. The Russian won 6-3 6-4 against her compatriot Elena Vesnina, who upset eighth seed Vera Zvonareva in the first round. "It was a good match. It's definitely more match practice," Williams told the WTA Tour's official Web site. "I'll hopefully get a couple more under my belt. I'm guaranteed at least one more, so hopefully I'll try to win some more. That's the goal." Second seed Safina had to battle back from a disastrous start before beating world No. 10 Agnieszka Radwanska 7-5 6-4 in her first match since October. The Russian lost the first five games but managed to save a set-point at 5-4 down and set up a quarterfinal clash with fifth-seeded compatriot Elena Dementieva. "Well, it was a little bit of a slow start, but it was a start. It was a winning start," Safina said. "It's not easy to play against Agnieszka. She's a top-10 player and plays very smart. "I was missing my timing until 5-0 but then I found my game. It ended up being a very solid match for me for my first match of the year." Dementieva progressed with a 6-2 4-6 6-2 win over unseeded Daniela Hantuchova, but her fellow Russian Svetlana Kuznetsova crashed out after losing to another Slovakian, Dominika Cibulkova. Cibulkova's reward for knocking out the third seed is a last-eight clash with sixth-ranked Victoria Azarenka of Belarus, who beat Japanese veteran Kimiko Date Krumm 6-1 5-7 7-5. In the men's draw, fifth seed Sam Querrey was eliminated in the first round by unseeded Russian Evgeny Korolev, who won 6-2 5-7 6-4 to set up a clash with another American, Mardy Fish. Sixth seed Viktor Troicki of Serbia beat France's Florent Serra 7-6 (7-5) 6-4 and will next play former Australian Open finalist Marcus Baghdatis, while German eighth seed will take on France's Richard Gasquet after his 6-3 6-3 win over Juan Ignacio Chela of Argentina.